Although only Dreyer’s third film, The Parson’s Widow is an astonishingly mature achievement. Many of the director’s chief characteristics can be recognised, appearing not as blueprints but in their already fully-realised form. To people who only know his more celebrated later works, the most surprising feature of The Parson’s Widow is its humour. Its comedy is in the tradition – as becomes a Swedish production of the time – not only of Mauritz Stiller’s well-known frequentation of the genre, but also of some of Victor Sjöström’s less widely seen or underappreciated masterpieces, such as Hans nåds testamente (His Honor’s Testament, 1919) and Mästerman (1920). All of these films are quiet, poignant comedies of love and ageing, strangely foreshadowing some of Leo McCarey’s 1930s films. Before this simple, fable-like didactic comedy of (mis)understanding properly starts to unfold, we see a young couple trysting in a soft, sunny landscape that brings to mind the idyllic happiness of the outdoor love scenes in Vredens Dag (Day of Wrath, 1943) – albeit without their hovering sense of doom and thus their fugitive intensity. 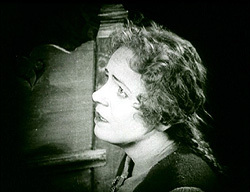 As we learn that the couple want to marry, a small bell-tower with three crosses – an image that could come straight out of La Passion de Jeanne d’Arc (1927) or Vampyr (1931) – tolls for the dead parson and announces a contest between prospective candidates for his place in the community. A theology student, Sofren (Einar Rod), decides to apply for the position, since, as Mari (Greta Almroth) reminds him, her father will not consent to their marriage unless he becomes a parson (and gets a job). The competition between the three candidates may be broad in its comedy, but its impact is founded not in comic effects or even acting, but arranged beforehand through Dreyer’s caricature-based casting choices. Not disdaining some mischievous tricks, Sofren defeats his two pedantic competitors, only to learn that the post includes marrying the former parson’s widow, old Dame Margarete (Hildur Carlberg). The intended bride is, naturally, aghast, but the practical Sofren seems determined to carry out his scheme, guessing that they will not have to wait too long before the old woman dies, allowing his marriage to Mari. Seduced by a herring and a bottle of schnapps, Sofren dozedly proposes to Dame Margarete and in no time they are married in a very traditional peasant wedding ceremony. Sofren presents Mari as his sister and brings her to live at the parsonage. Not long afterwards, and while the already thrice-widowed lady energetically reasserts her control over the household and farm, Mari accidentally falls down into a cave, and only Sofren’s hasty warning saves Dame Margarete from the same fate, with probably still more serious, even fatal, consequences. This automatically decent warning, for which we see Sofren almost instantly repent, somehow moves Dame Margarete, leading us to infer that she suspects something about the true relationship of her new husband and the young girl. After tenderly nursing the bed stricken Mari for weeks, the old woman tells them about her first wedding: her long-standing bridegroom had to marry the previous parson’s widow to get the appointment, and they felt guilty for building their future happiness on the hope of her death. Ultimately, they had to wait for five years until they were able to live together contentedly for 30 years more. Amazed at being roughly told their own story, Sofren and Mari confess the truth. Dame Margarete meets this confession with melancholy understanding, having gone through the same predicament. Dreyer’s films have often been accurately described as dealing with different manifestations of intolerance. In contrast, The Parson’s Widow shines in his early career as a quite unpretentious lesson in tolerance, quietly unfolding to its predictable, logical conclusion, with a masterful control of acting, lighting, framing and general composition. The film breathes with a kind of naturalness, not needing to resort to obvious visual metaphors or “significant” editing. It foreshadows the “realistic” freedom only fully allowed by the arrival of sound and the long takes (and shots) that dominate his later work (and which are so sharply in contrast with the films he made just before and after the introduction of sound, La Passion de Jeanne d’Arc and Vampyr). All of the actors in The Parson’s Widow give surprisingly understated performances, quite different from most players in contemporaneous silents produced in both Europe and the United States. These performances can startle us even today for the utter modernity of their acting style. Without any explicit explanation, and only the most spare of titles, we instantly understand whatever is going on in the mind of every character. This sort of immediate expressive visual communication seems lost to the vast majority of filmmakers presently working.